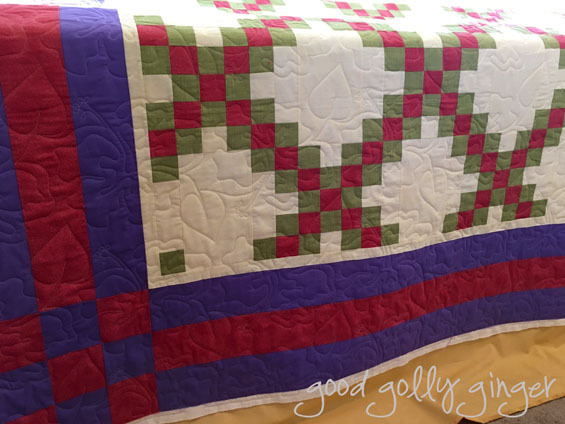 Willa Mae created this lovely Irish Chain quilt with beautiful solid fabrics. 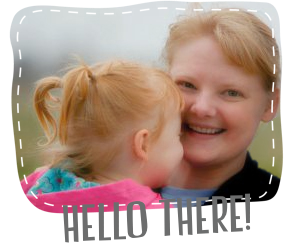 It's so simple, and then she added those wonderful borders. I quilted this with a lovely all-over hibiscus pattern in ivory thread which shows beautifully on the solid fabrics. 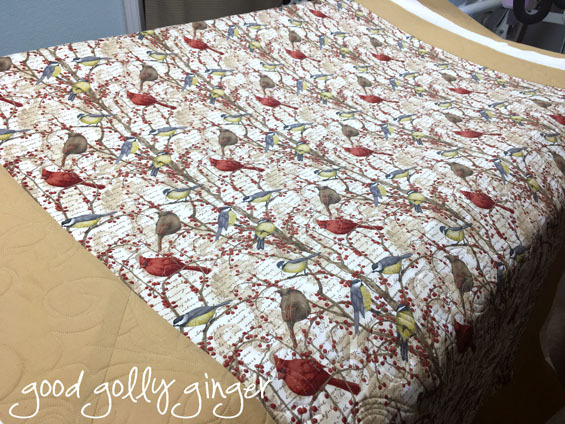 Willa Mae loved this cardinal fabric, and so she created a simple quilt using the width of the fabric and large borders. 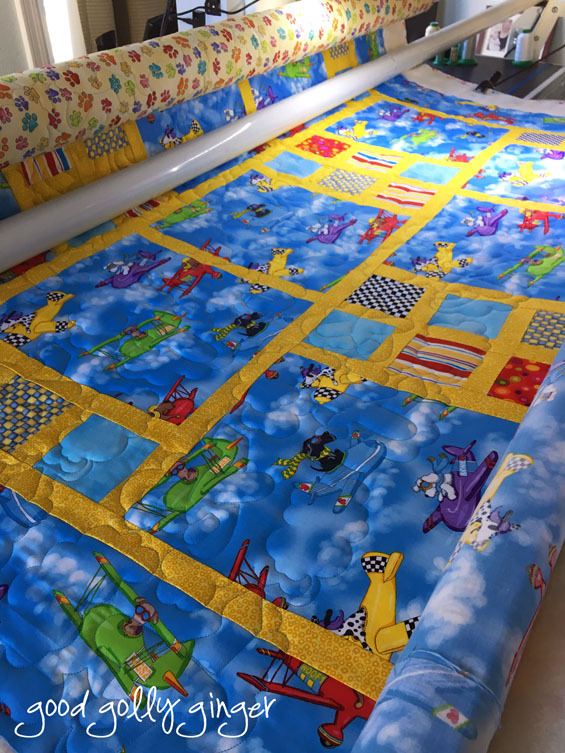 It's a perfect "man quilt" and a great way to finish a quilt fast. 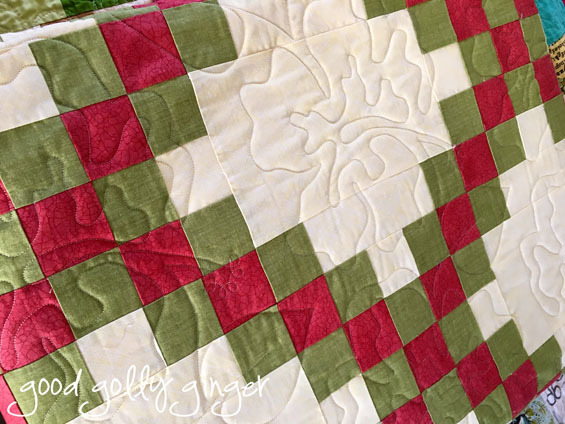 I quilted a holiday spray all-over pattern in taupe thread. It's simple, and it's perfect. 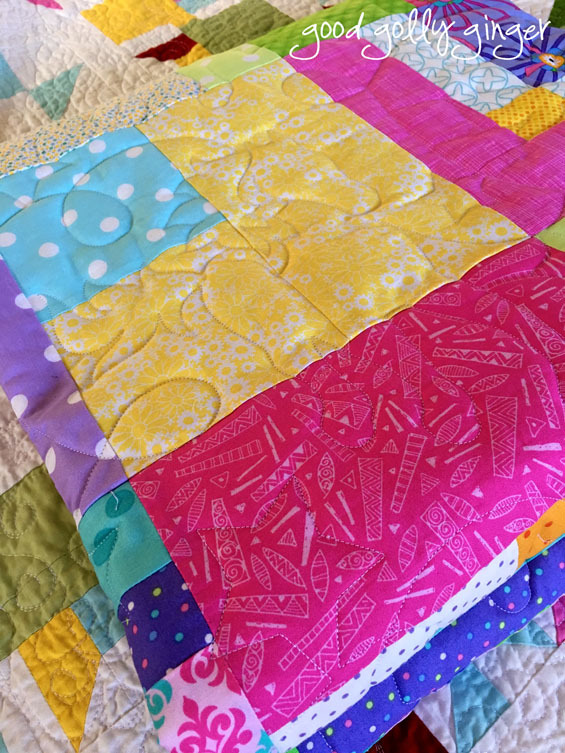 Thank you, Willa Mae, for letting me quilt for you. 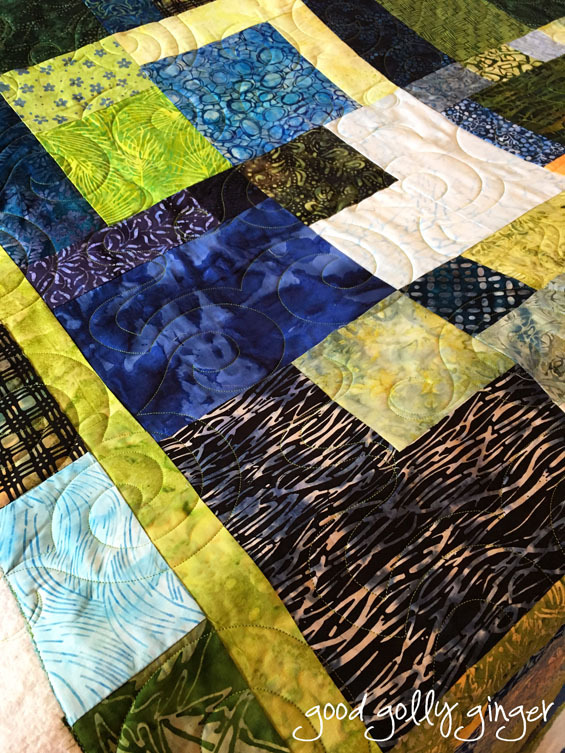 Jan brought me four lovely quilts for longarm quilting. 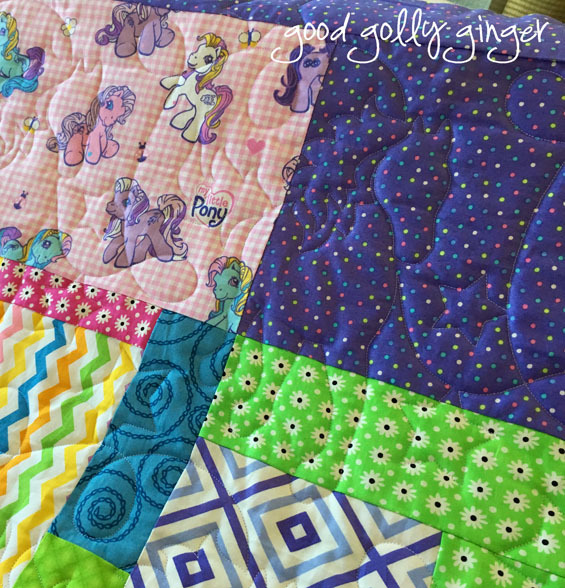 The first one is a sweet girly quilt with an appliqué horse. Jan chose an equally sweet all-over horse motif in ivory thread. 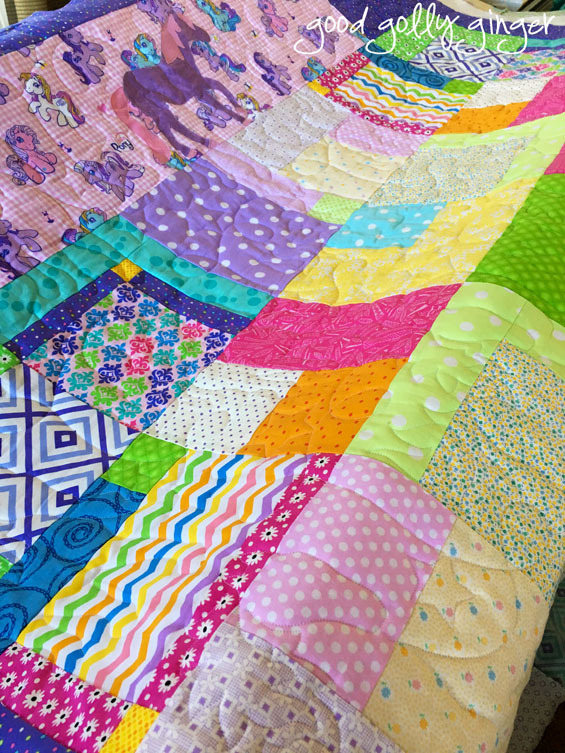 It all makes for a very whimsical quilt for a horse-loving girl. 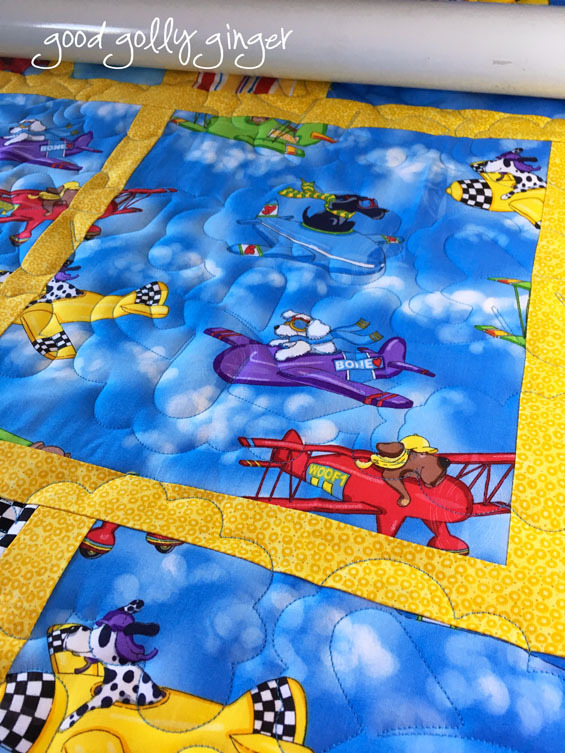 The next quilt is filled with airplanes. The airplanes have gone to the dogs. I love that fabric! Jan chose an all-over airplane and cloud motif in light blue thread. It turned out super cool. 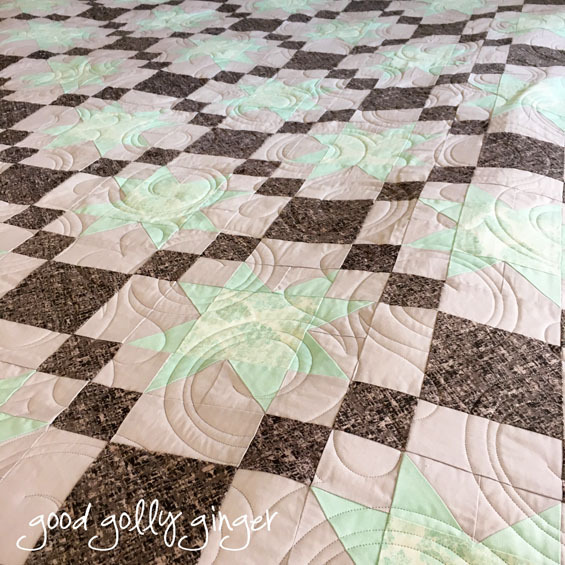 Jan loves horses, and this next quilt really proves it. Look at all that wonderful horse fabric. Jan chose another horse motif in brown thread. 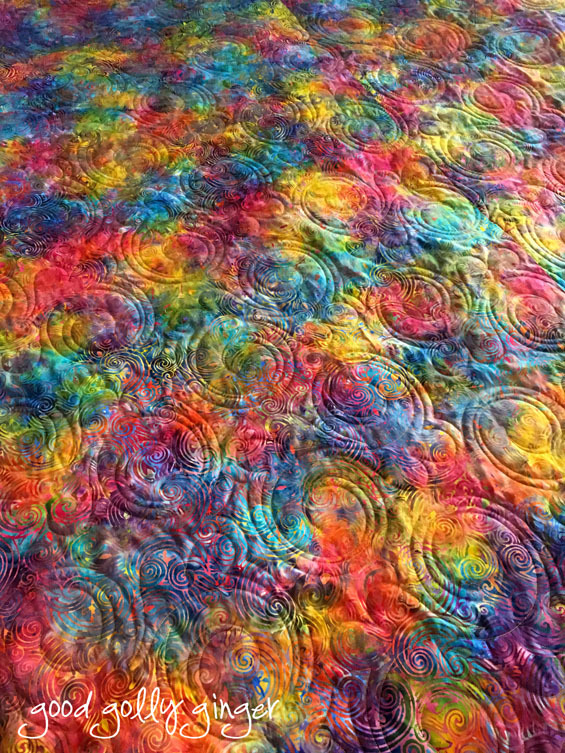 The last quilt is a wonderful batik lap quilt. Jan chose an all-over spiral pattern in lime thread. 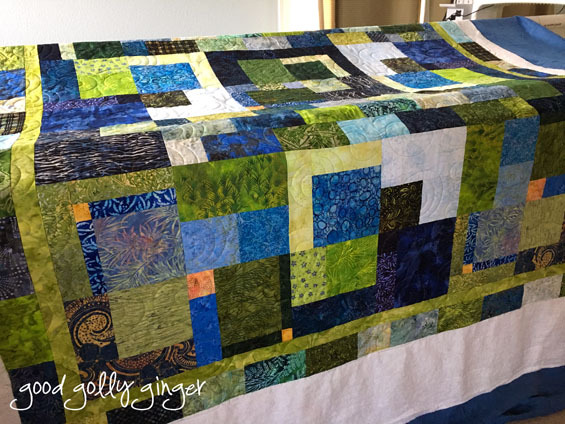 I love the lime thread on the deep blue blocks. 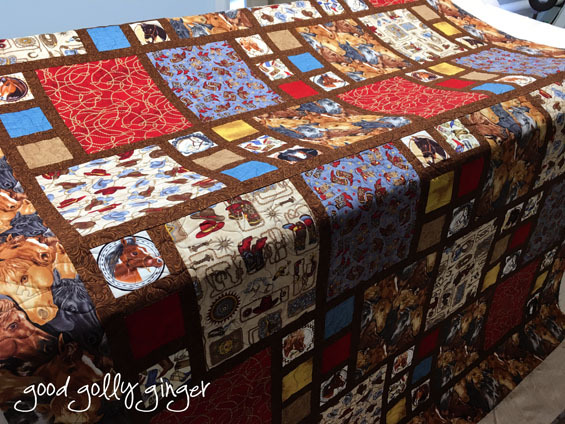 Jan, thank you so much for letting me quilt your lovely quilts for you. 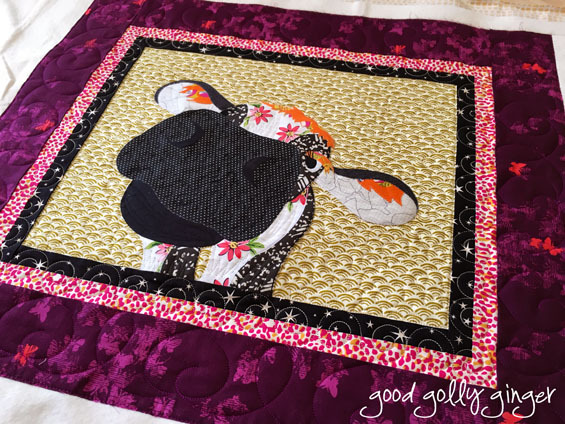 My quilt guild had one of those quilt challenges, and that's how my funny cow wall hanging was created. It's a bit funky, but none-the-less loved. I drew the cow by hand, and then used raw-edge appliqué. 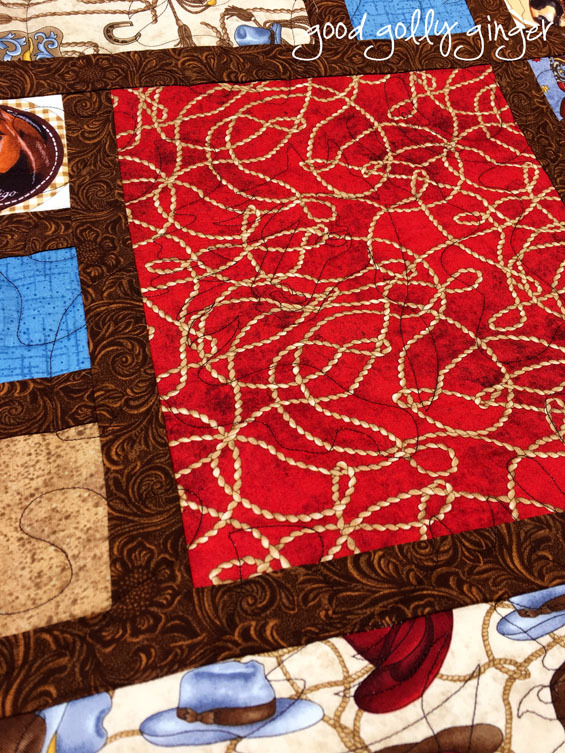 I finished it with custom quilting. 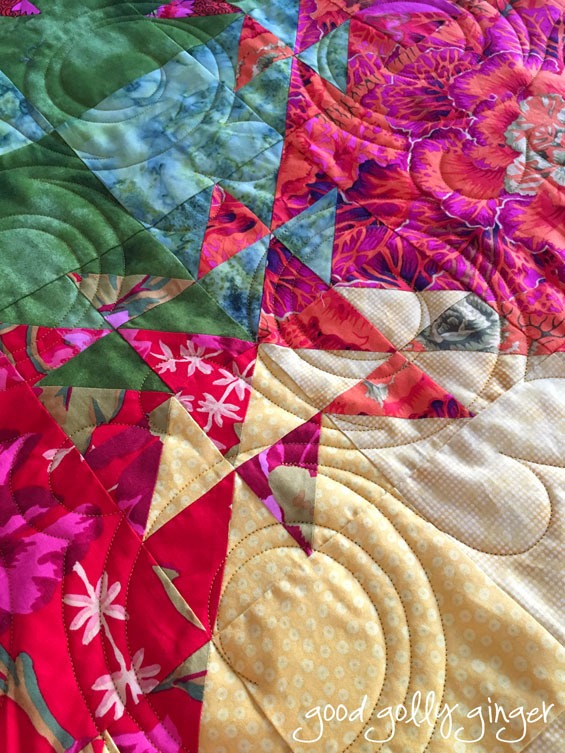 Willa Mae made this beautiful Morning Star quilt as a wedding present for her grandson and his bride. The bride and groom chose these wonderful colors. This is a BIG quilt (96"x111"). Every quilt that Willa Mae has brought me has been big, even the baby quilts. 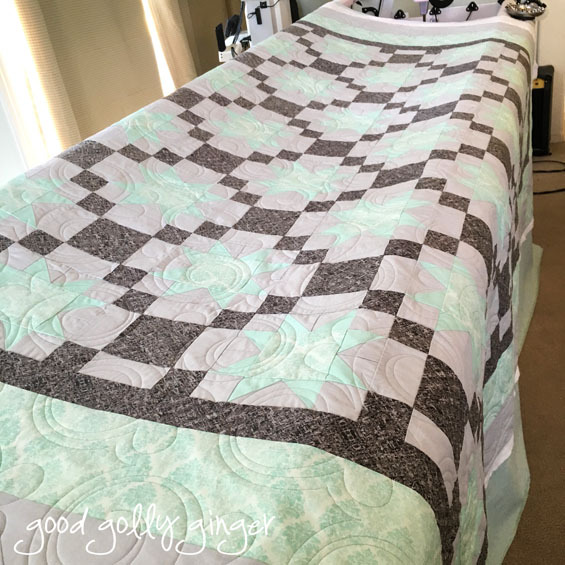 I quilted this with an all-over twisted feather design in grey thread. 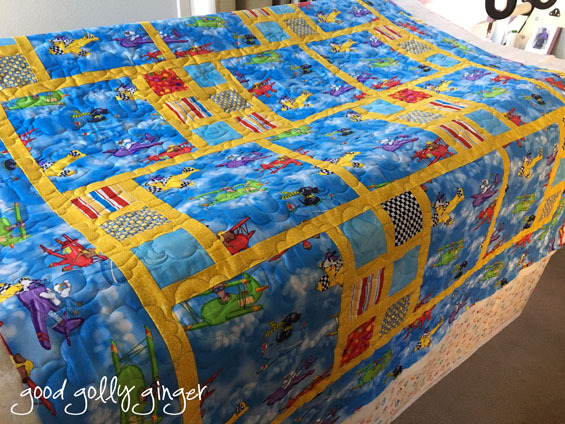 Thank you, Willa Mae, for letting me quilt this beauty for you. 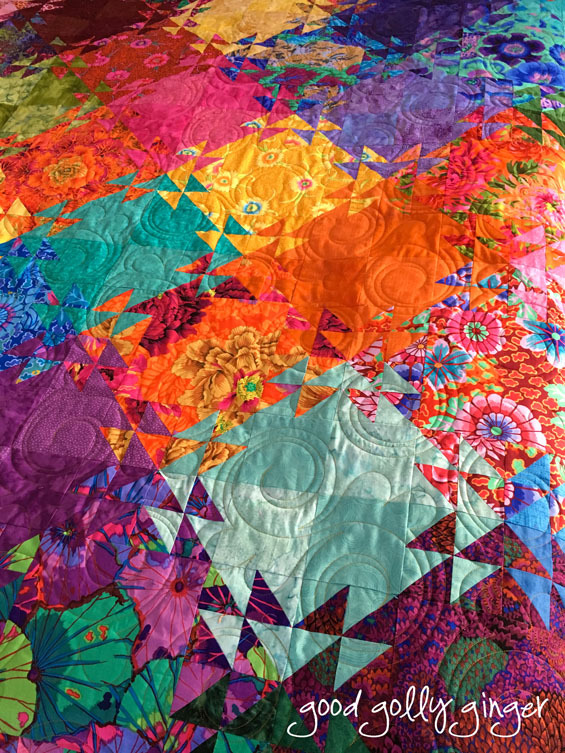 Carol made this beautiful Shimmering Triangle quilt with Kaffe Fassett fabrics. 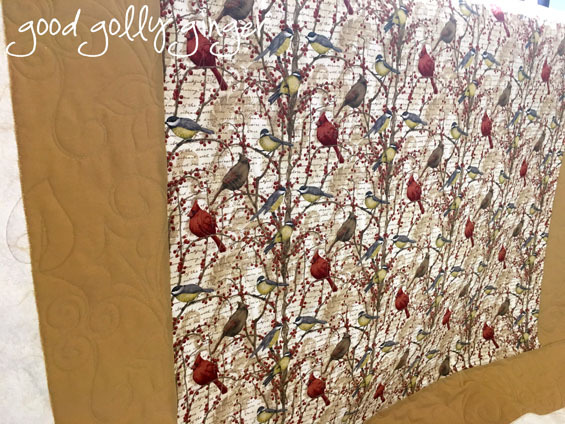 I used a twisted feather pantograph with gold thread. 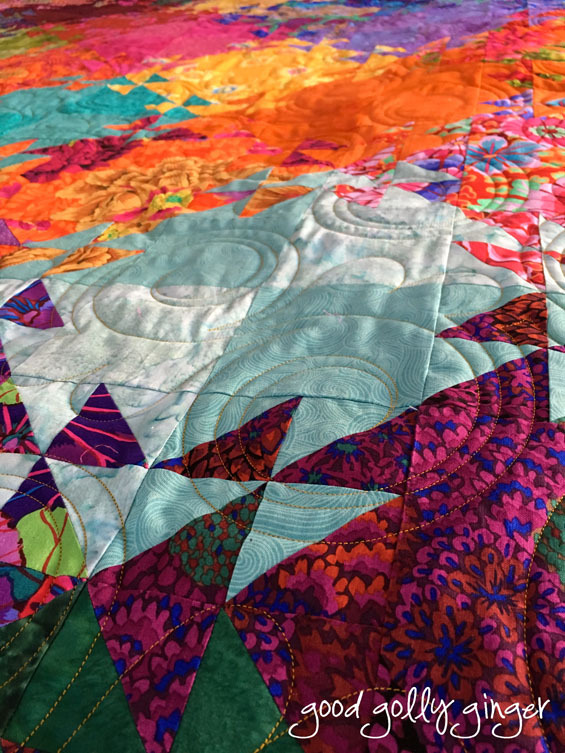 This is such a beautiful and colorful quilt. 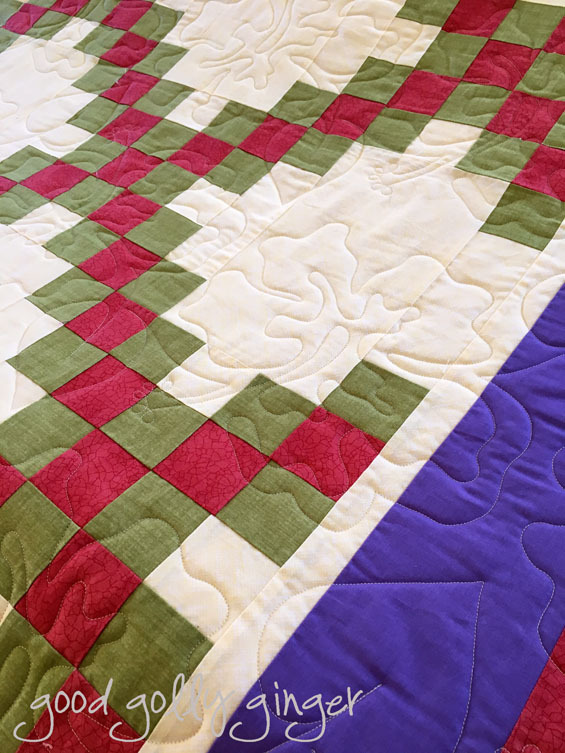 Carol found and chose the perfect backing for the quilt. 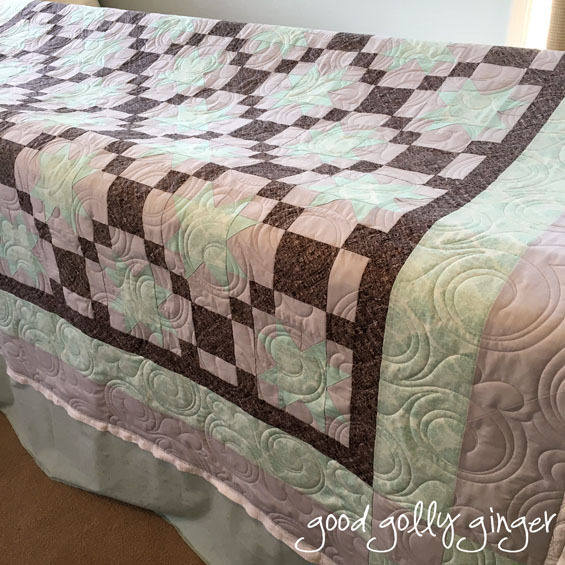 Thank you, Carol, for letting me quilt this wonderful quilt for you!